Farmer raj Anna has been making unprecedented profits from his farmland since the past few years. The 42-year-old earns more than Rs 15 lakh a year. Ask him how he manages such a handsome income and he replies—through human excreta. Anna is one of the 1,000-odd farmers in Bengaluru who have revived the lost practice of using human excreta as manure. “Our ancestors used human excreta in farmlands. In fact, as a child, I saw my father design a latrine using a net of wood. In summers, he would cover the latrine with husk. Later, he would use the waste in the farm,” says Anna, adding that it was a natural process in the earlier days as people would defecate in farms. “With the popularity of modern-day latrines this practice has reduced in the past few decades,” he points out. 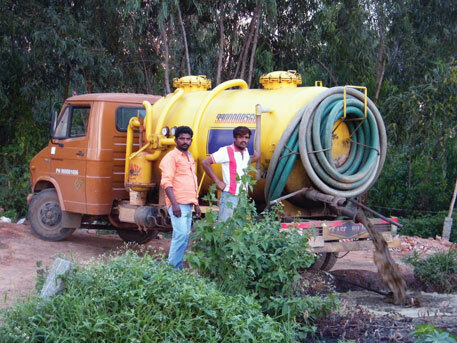 Anna, who was the first farmer in Bengaluru’s Veer Sagara suburb to start using human waste as manure, explains that the idea came to him one day when he saw a honey-sucker truck—a specialised vehicle used for extracting and transporting waste—dumping human excreta in a fallow piece of land. “Initially, I would wait for the trucks to dump the waste in fallow land and then transport it to my farmland. Later, I dug a big pit and asked the drivers to directly dump the waste on my land,” he says. According to him, it is a win-win situation for all, with him getting free manure and the trucks getting a free space to dump the waste. “In a few months, I started getting so much waste that I began selling it to other farmers,” adds Anna. Today, this has started an informal trade in Bengaluru which is benefiting the farmers, owner of honey-suckers and citizens who are not connected to the sewerage system. The informal sector today employs close to 200,000 people and is worth Rs 75 crore. Bengaluru has a population of 8.5 million, as per the 2011 Census. Ideally, the Bengaluru Water Supply and Sewerage Board (BWSSB) should take care of sewage treatment and disposal. But the reality is that just 40 per cent of the city is connected to the sewage network, according to the Comptroller and Auditor General report 2011. The rest of the city, or 5.1 million people, have on-site sanitation with off-site disposal, or are forced to defecate in the open, says a paper prepared by the International Water and Sanitation Centre in 2012. Bengaluru-based engineer S Vishwanath, who coauthored the paper, says the huge population in the country not connected with the sewage system has to find its own way to handle the waste. This is the basis of the new informal economy that is emerging in the city. The areas that do not have a sewerage connection have septic tanks and rely on private honey-sucker operators to empty the tanks. The truck operators, who earlier struggled to find wasteland to dump the excreta, now have free space in farmlands. Nageshwar Rao, who owns eight honey-sucker trucks, admits competition has increased in his business after farmers started taking the waste. “Earlier, farmers were approaching vehicle owners and even giving money to have the sludge dumped into their fields. Now, there is much competition in the market. We approach the farmers to take the sludge to their fields,” says Rao. He reveals that earlier he used to charge at least Rs 1,500 to clean one pit, but the cost has come down because of increased competition. “We at times are forced to offer services at as low as Rs 700,” he says. While there is no official figure available, operators claim that at least 500 honey-sucker trucks are active in the city. This boom is also helping the manufacturers of honey-sucker trucks, who say they are finding it difficult to meet the surge in demand. “We take 20 days to make a honey-sucker truck with the capacity of 4,000 litres. It costs the customer Rs 2.5 lakh. But now many people are converting regular tankers into honey-suckers for gathering and carrying waste,” says Doreswami, who owns one of the two major honey-sucker manufacturing garages in the city. The farmers who have taken to the practice say it has benefited them in more ways than one. For starters, their dependency on fertilisers has gone down. 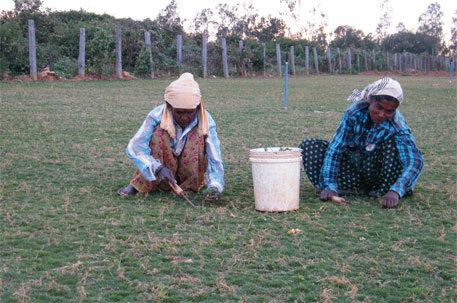 They are also saved from the side-effects of chemical fertilisers. As a result, Anna, who owns 2.5 hectares, now farms on an additional 2.5 hectares he has taken on lease. “I recently bought a crop cutter worth Rs 4 lakh and plan to take more farmland on lease,” he adds. “Human excreta contains nutrients such as nitrogen, phosphorus and potassium, which is good for plants,” says C A Srinivasamurhty, professor and head of the soil science and agricultural chemistry department at the University of Agricultural Sciences, Bengaluru. In fact, the 2012 paper carried a case study on the annual value of human excreta in the African nation of Niger. It shows that average excreta produced per family per year in Niger is equivalent to approximately 90 kg of chemical fertiliser, which is well beyond the reach of any small farmer. The situation will not be very different in India. While the people are happy with the arrangement, experts warn that dealing with human waste poses some health concerns as well. For instance, it can lead to cholera, diarrhoea and several other infections. Vishwanath also points out that using human excreta directly on farmland increases the chances of groundwater contamination. “Bengaluru’s water level is low, which reduces the risk of groundwater contamination,” he adds. Experts believe that the new informal economy that is picking up in Bengaluru offers a viable method to reuse human waste. They suggest government intervention to regularise the system. “The country is struggling with its waste and this offers a solution. The only problem with the model is that it is unregulated. If monitored properly, this locally developed model can play a significant role in handling human waste,” says Vishwanath. If Eco technology is retrofitted into the sewage, it can address CHEMICAL TOXICITY & BIO HAZARD. After this, it becomes safe for farming use. Dumping septage in to farm land without further treating and making sure that there are no dangerous pathogens present in the effluent is very dangerous. This business will get more acceptability only after individual owner treats all the black water to the level of 0% contamination level, get it tested from approved Public Health Lab and then only he should be allowed to empty the septic tank. The Bangaluru Municipal Council must act immediately to stop this health hazard and frame well laid out guidelines for the same. If we can do that, lot of load on city sewage treatment can be reduced and farmers will get more income from their farm land. Hence immediate action is required considering all these benefits so that ordinary citizens will not be exposed to dangerous health hazard. Architect and Social Entrepreneur. pune. instead of using directly better way is to use it in a biogas plant tht can be built on community basis with bottling unit for supplying biogas in cylinders to village and the left over from biogas plant can then be used as organic manure among the farmers. the unit can be run on co-operative basis by giving employment to rural youth and clean fuel for cooking to rural women with organic manure to rural farmers considering the harmful effects of biomass usage in cooking as stated by CSE on health of rural women.